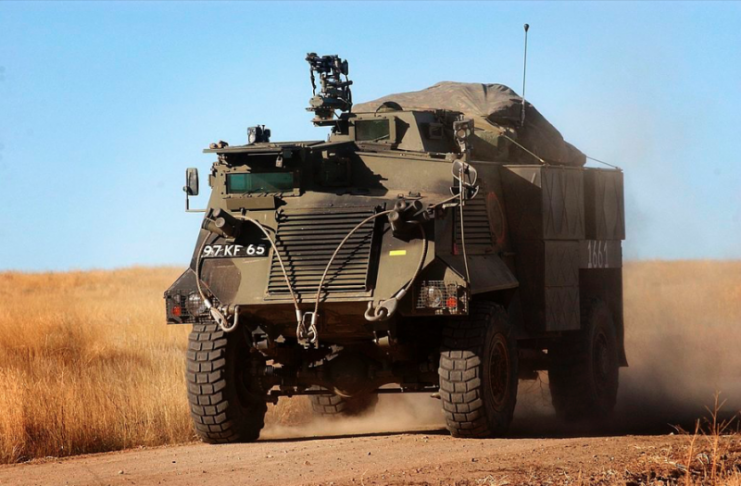 From the first improvised vehicles to professional, custom-made versions, the British army’s armored personnel carriers (APCs) saw some serious changes during the 20th century. In the summer of 1944, the First Canadian Army was serving under British command as part of Allied forces sent to liberate France. 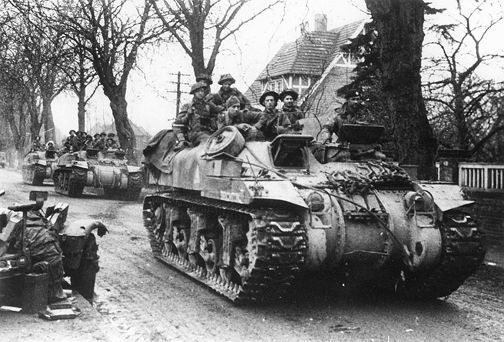 The Allied advance had stalled outside Caen, and now the Canadians were tasked with taking the city. 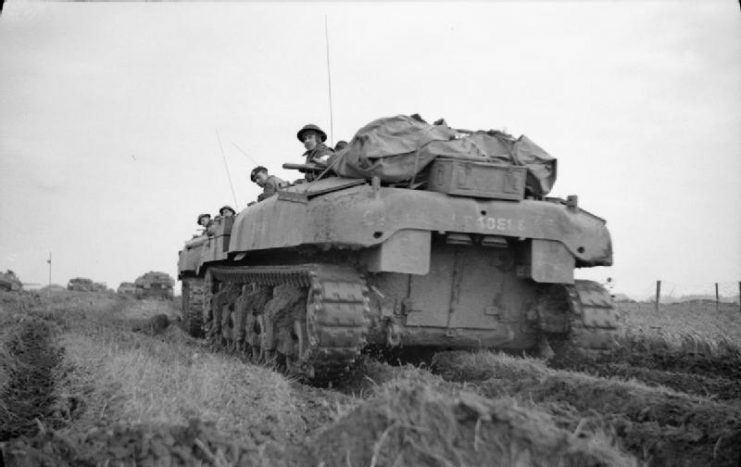 General Simonds, commander of the Second Canadian Corps, decided that the best way to advance the infantry quickly would be in armored vehicles. Since he didn’t have anything suitable, he would have to improvise. Ram Kangaroo armoured personnel carriers carrying infantry of 8th Royal Scots during the assault by 15th (Scottish) Division on Blerick, 3 December 1944. With the permission of their American owners, Simonds handed 75 M7 Priest motorized howitzers to a workshop detachment codenamed Kangaroo. 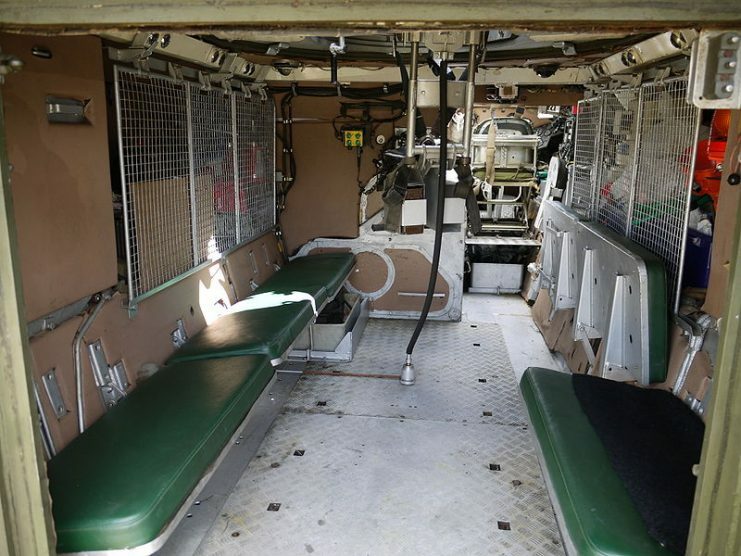 There, the engineers removed the howitzers, ammunition racks, and seats from the vehicles, before adding extra armor. Some of this armor was taken from abandoned landing craft. When supplies of armor ran out, they improvised again, packing sand between sheets of steel. 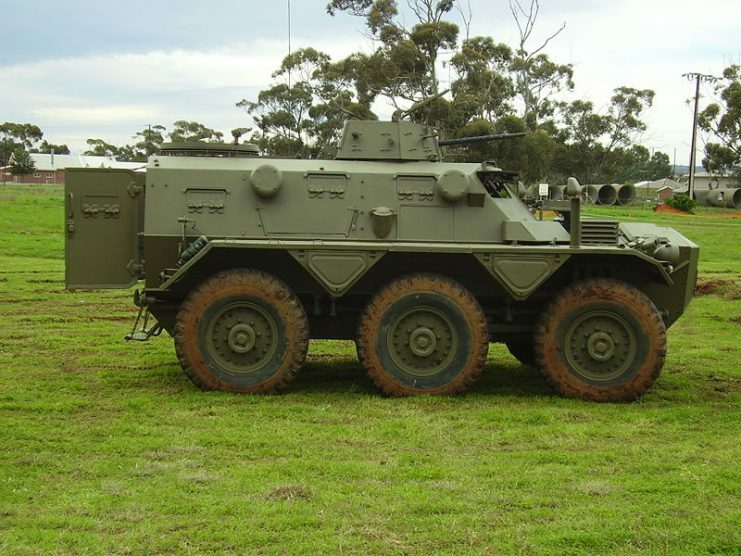 These early APCs took their name from the team who had built them – Kangaroo. The infantry had only a day to practice with the Kangaroos before going into action. Despite this, they proved a huge success. 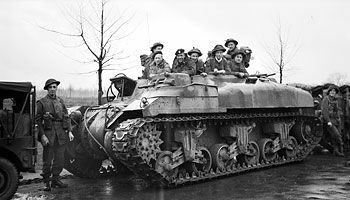 The British converted more vehicles, including Sherman and Ram tanks, into Kangaroos. 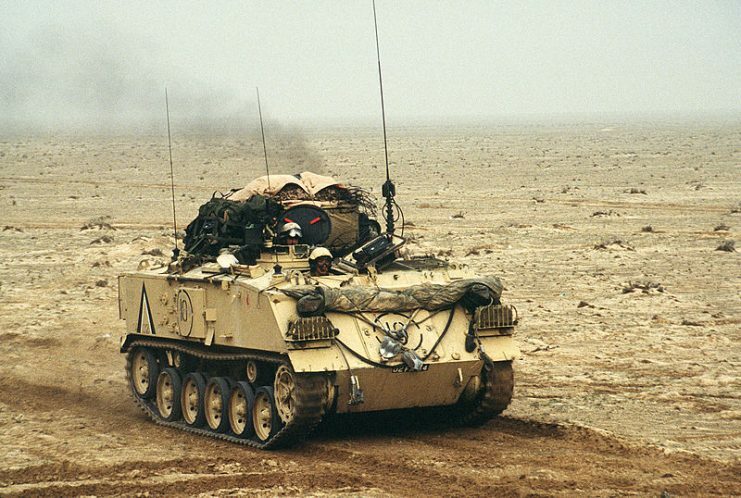 The effectiveness of these vehicles shaped the development of post-war APCs. 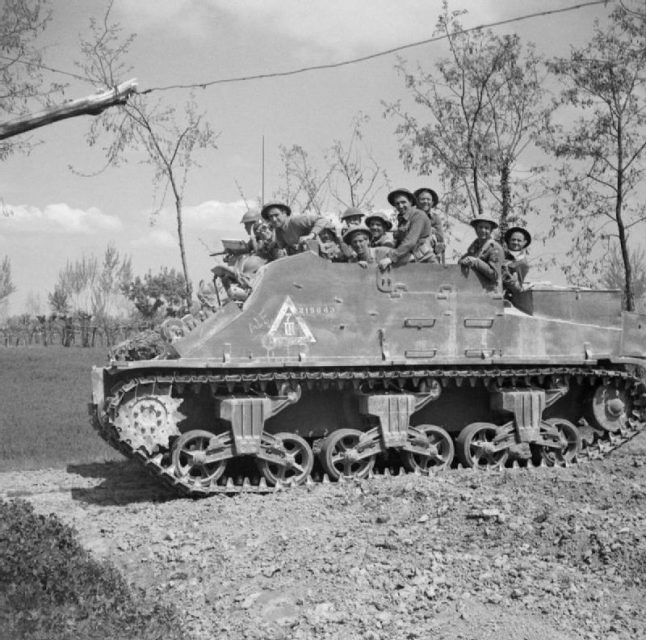 A Priest Kangaroo of 209th Self-Propelled Battery, Royal Artillery, transports infantry of 78th Division near Conselice, Italy, 13 April 1945. 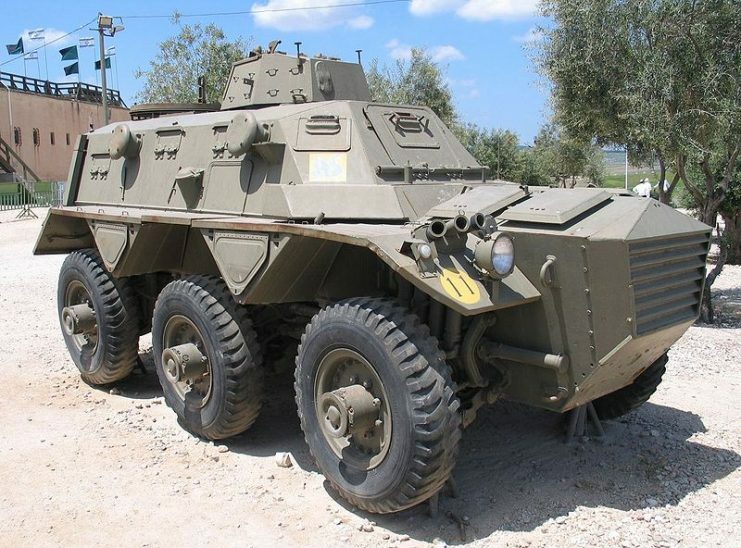 Britain’s first purpose-built APC, the Saracen, entered service in 1953. While the Kangaroo had kept the tracks of the vehicles it was made from, the Saracen drove on six wheels, the front four of which were used for steering. The suspension, which involved independent springing for all six wheels, allowed the vehicle to keep going if one of those wheels was blown off. The hull was made of welded steel. At the front was the engine. Behind that sat the driver, and behind him the radio operator and commander. 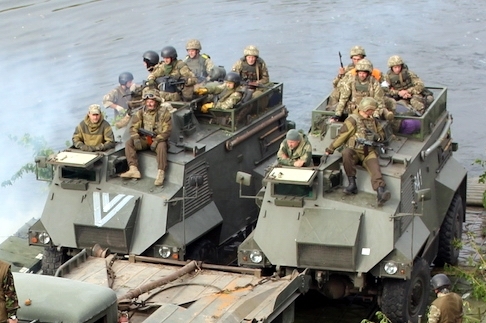 A crew compartment behind them could seat up to ten infantrymen. Alvis Saracen at the War and Peace show 2010. Doors at the rear let the troops in and out, while firing ports in the sides let them fight from the safety of the vehicle. A small turret holding a machine gun gave the unit extra firepower. A hatch near the rear had a mounting for a light machine gun. 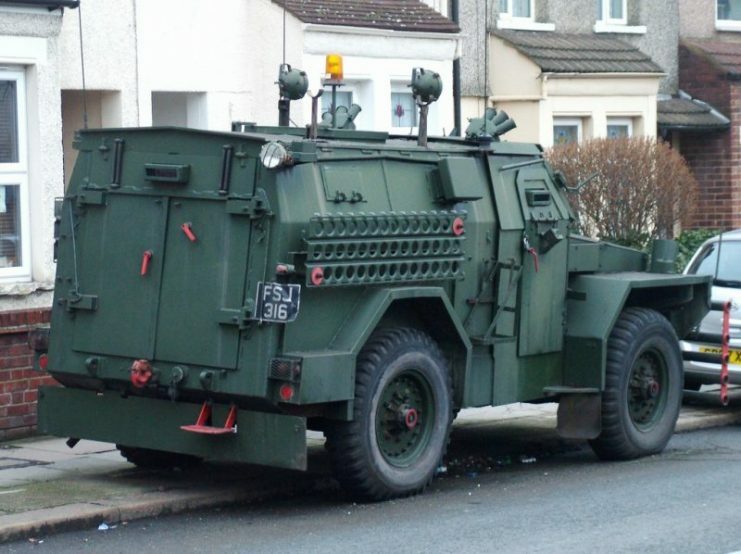 The Saracen was widely used by the British Army. Some were adapted to create command vehicles, ambulances, and transport for artillery targeting computers. The vehicle was also sold to other countries. The Saracen provide the British Army with an important tool it had been missing, but it took time to manufacture the number of Saracens the Army wanted. In the interim, another vehicle was needed, so it was time to improvise and convert again. In the early 1950s, motor companies produced a range of cargo vehicles with good cross-country performance, specially for use by the military. One of these, a four-wheel-drive one-ton truck, had been produced by Humber Motors. 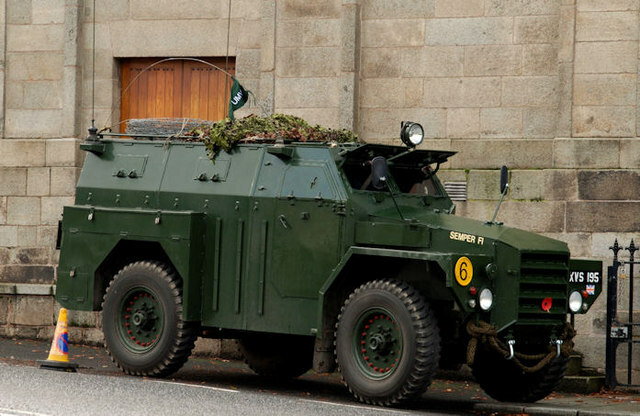 The Humber vehicle was now fitted with an armored body, turning it into a primitive APC. 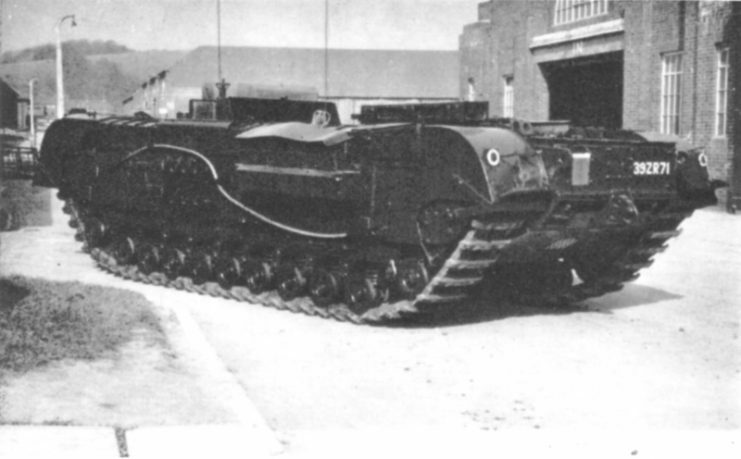 It was only used until enough Saracens could be built to equip British infantry, then the vehicles were scrapped or sold. In the late 1960s, the Humber Pig saw a new lease of life. Northern Ireland broke out into the period of heightened violence known as The Troubles, during which British troops policed a region torn apart by Catholic and Protestant terrorists. The surviving Pigs were bought back by the Army and used for internal security work. 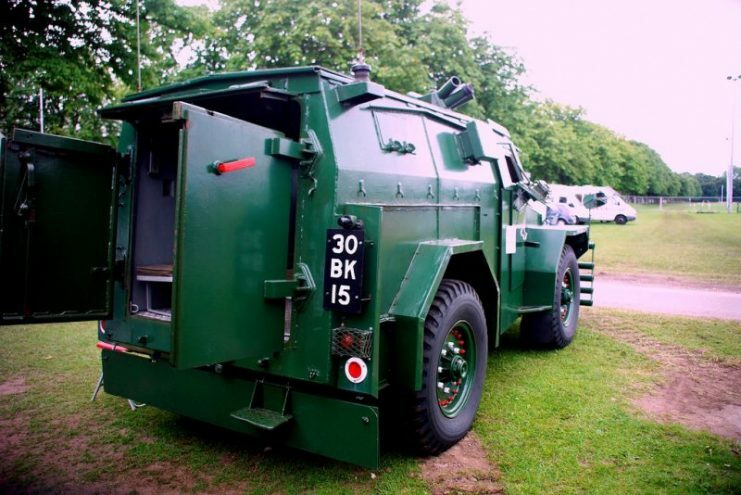 Developed by GKN-Sankey Ltd in 1970, the Saxon was meant to provide an inexpensive APC for security work. It used the engine, chassis, and suspension of a Bedford MK truck, and this use of civilian parts helped to keep costs down. On top of this chassis, the designers built a blocky, flat-sided body of welded steel with a cupola on the roof. The driver sat at a center-front position, immediately behind the engine, with the commander behind him – a common layout for APCs. 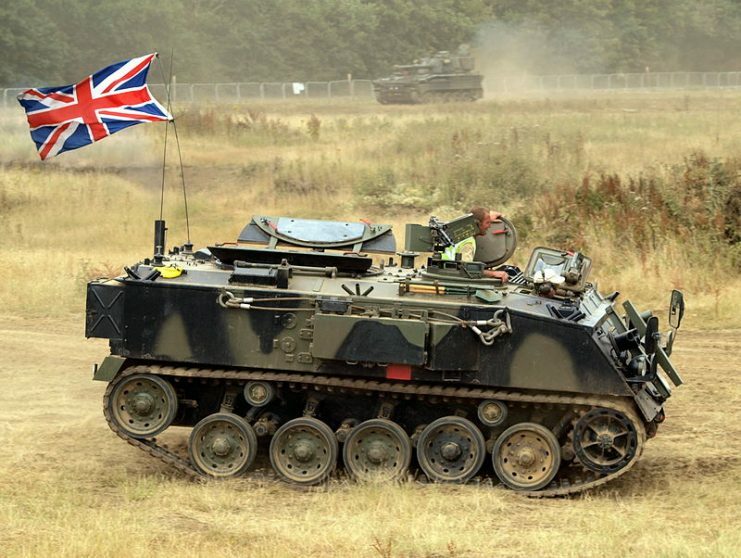 A Saxon Armoured Personnel Vehicle from the Cheshire Regiment moves at speed into battle. Soldiers from The Cheshire Regiment, 1 Mechanised Brigade 3 (UK) Armoured Division take part in Exercise Iron Anvil at the British Army Training Unit, Suffield, Canada. 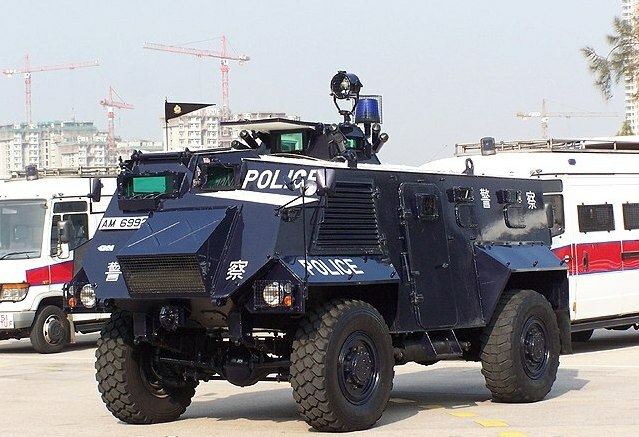 The cupola provided the commander with a good field of vision around the vehicle and could also be fitted with a machine gun or grenade launcher. The main crew compartment had both doors and firing ports in the sides and rear. It could carry nine infantrymen. Extra options for the Saxon included searchlights, smoke projectors, a winch, and a front-mounted blade for clearing obstacles. 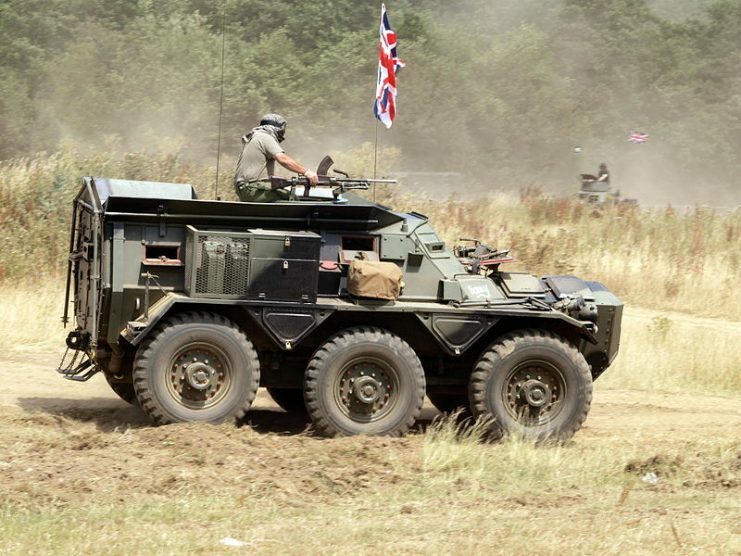 As well as being used by the British Army, the Saxon was sold to other countries, including the Netherlands and Brunei. 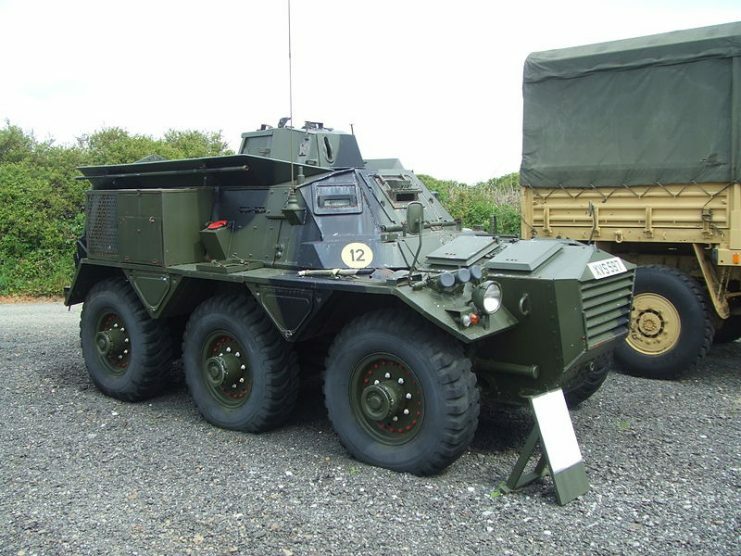 Unofficially known as the “Trojan,” the FV432 was another GKN-Sankey creation which was introduced in the early 1960s. It had a simple rectangular shape with flat sides, a sloped front, and a relatively low profile. The driver sat at the front right of the vehicle with the engine to his left. The commander sat behind him and had a hatch for observation and for the use of a mounted 7.62mm machine gun. 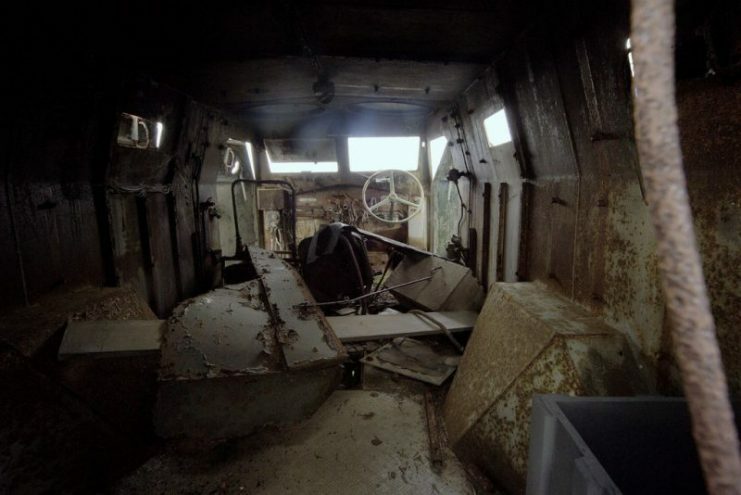 The crew compartment of the FV432 could carry ten soldiers. It was accessed through a full-width door at the rear and a hatch in the roof. A product of the Cold War, the FV432 reflected advances made since the Second World War. Filters provided the inhabitants with protection from nuclear, biological, and chemical agents. A screen could be erected around the hull that gave it the buoyancy needed to cross rivers. The FV432 could be adapted to a variety of uses. 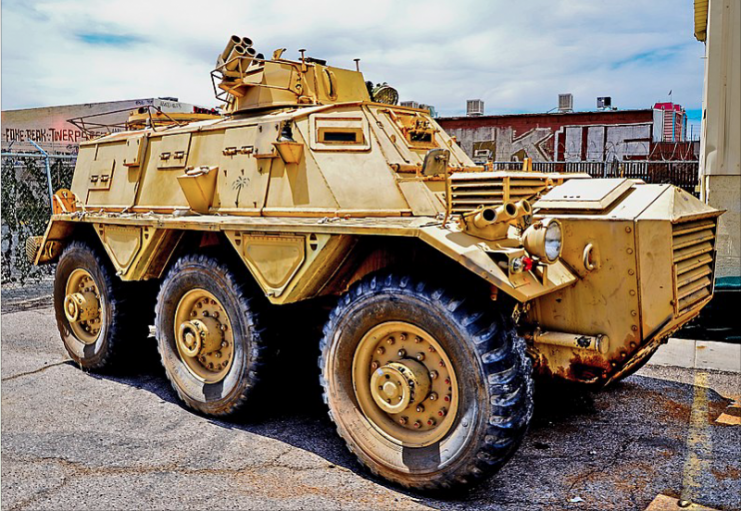 Variants included ambulances, mine-laying vehicles, and a mortar carrier.